During the main season from mid January to April the weather is beautiful and warm. From May to November however all is much more green. While in the «green period» the days are cool and fresher, it is sunnier and more colourful in the main season, as many trees flower during these months. Our area can only be reached by foot or by horse, which we gladly provide. That’s why holidays at our place are particularly exciting, because the journey is already part of the adventure! 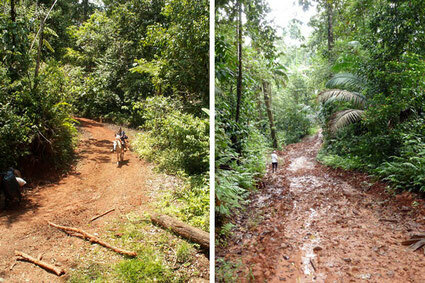 The primary rainforest on the pensinsula of Osa will offer you some unforgettable impressions of nature at its best. It is known as one of the areas with the largest amount of different species in the world.